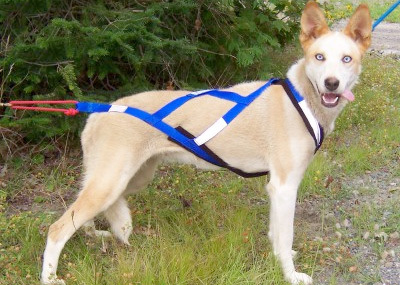 The Standard Weight Harness is an X-Back style with padding that extends to the end of the rib cage for maximum comfort! Made with 3,800 lb test 1" nylon webbing and triple thick 300 weight fleece padding. The tug ropes are color coded to the size and graduated for an easy fit into the gangline. 24" of 3M reflective tape sewn on is included and located at the neck, sides and tail. Stock colors are red and blue.